In determining if a person's pain may be related to some sort of intervertebral disc pathology, a great deal of emphasis is placed upon imaging studies showing evidence of mechanical compression of a nerve root by abnormal posterior displacement of a disc (i.e. bulge, protrusion, herniation, etc.)  as portrayed in the below illustration. In cases where clear mechanical compression of the nerve roots is not shown in imaging studies, some are quick to argue that any pain emanating from the area is either exaggerated or entirely contrived. However, a person can experience pain consistent with mechanical compression of a nerve root without having any significant disc pathology. This is because the spine is encircled with a meshwork of nerves that are much too small to be seen on CT or MRI (see the below figure). 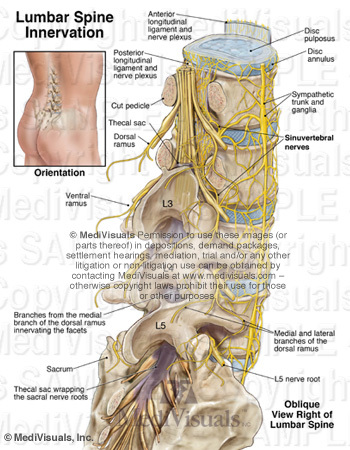 The sinuvertebral nerves surround and penetrate the intervertebral discs. 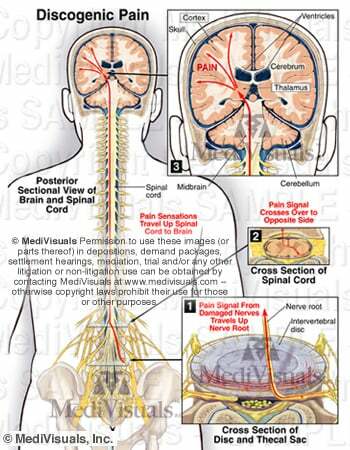 When injuries to a disc are more subtle, the sinuvertebral nerves may detect the injuries and send pain signals to the brain where they are interpreted as pain (see figure). The pain may be limited to the area of the back, or a pain perception phenomenon know as "pain referral" (confusion of the origin of pain signals by the brain) may result in the person experiencing very real pain consistent with radicular pain from mechanical nerve root compression by a severely herniated disk. Another common cause of pain consistent with nerve root mechanical compression is chemical irritation or inflammation of the nerve root. 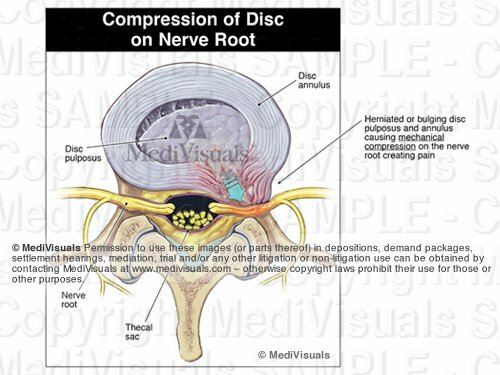 Chemical irritation of a nerve root often results from the release of chemicals following a more subtle disc injury (see the below figure). These chemicals irritate and inflame the nerve root and surrounding tissues, resulting in the perception of pain consistent with an injury to the disc and mechanical compression of the nerve root. Even after resolution of chemical irritation and inflammation, scar tissue may develop that binds the nerve root (often undetectable on CT or MRI). This scarring can cause permanent debilitating pain that may require surgical intervention.